I don't often review places on BA, but I feel the need to add my opinion on this place. I stopped in a few times while doing some work in the area. The short version: this is not a spot for beer geeks. It's a spot with very tasty pizza, where locals drink a variety of beers, few of which are very good. Atmosphere: It's laid out as a big open hall, with the food ordering and pickup near one end, and the bar at the far end. The bar is a neat setup, with a rear window onto the seating area, allowing food patrons to go pick up a pint. Lots of local history in the decor. Quality: I tasted a whole lot of their beers, on several visits, in the hopes of finding something I'd be excited to drink. Each time, I struggled to find anything I even wanted to down a pint of. Their beers were all bland, often with odd off flavors. To put it simply: do not go there for the beer. Service is good, though it's better if they know you. I got overlooked for a while at one point, but the bartender was very apologetic when she realized what had happened. Selection: lots of different beers, but none of them very good. I knew I was in for trouble when I saw the big BMC (Budweiser?) sign that said something like "Welcome to microbrew country!" 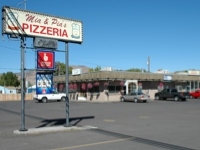 Food: I had pizza from Mia and Pia's several times, and I really enjoyed it. Quality toppings, crispy crust. Yum. I had trouble finding good takeout food in Klamath Falls, and this place filled that gap nicely. Overall: A locals joint, with good food and mediocre beer. They know where their bread is buttered, and it ain't out-of-town beer geeks. I say let the locals drink it, and pick up a stellar bottle from the Portland Street Market instaed. Looks like it should be condemned from the outside. Don't let appearance scare you off. Staff was amazingly, almost unbelievably friendly. You can try anything. Surprisingly large selection of beers they brew about 6 miles away, maybe 13 of their own taps. They had just tapped their summer peach ale. Fruit beers aren't my forté, but this was excellent. I ended up with the dopplebock, which was superb. The bar area is pretty old school and has a cool vibe. The rest of the joint is pretty blah, with a dining area and an arcade area with about 10 machines. The pizza was solid and reasonably priced. I'll be back next time I am in the area. Had the I.P.A. One of the worst beers I've had. Couldn't finish it. While I was there another patron returned hers as "flat" and couldn't drink it. Divided into a food shack and a bar room, with an intercom in between, this brew-pub is constructed largely of re-claimed materials from the outlying dairy where the brewing actually takes place (just out of town somewhere). I found the udder-pump chandeliers to be especially charming. A guide-book explains the beer making process and features lots of photos of the brewer at work, using skills and materials from his family dairy...unique and rather cool. Definitely a local spot with lots of smack-talking between the grizzled patrons and the grizzled bar-maid. Football on every TV and BMC bottles available for those who aren't even adventurous enough to sample the brewer's take on a variety of easy drinking lagers...otherwise lots of draught ales from barrel aged barleywine to porter, amber, ipa, witbier, etc. I had the porter and wit, both of which were original and delicious examples of the styles...though authenticity is not paramount (I was offered an orange or lemon wedge with my beer which I declined). Flavors were potent and fresh, though their IPA had some deficiencies. Samplers are a great deal (as others have previously mentioned). The pizza features seasoned ground beef, linguica, and other unusual ingredients that seem right at home in the area. All the pies were in fact very good. Located outside of downtown K-Falls in a neighborhood, interesting location. Walking in my wife says "I am certain that every man, women, and child has killed and field dressed an animal" pretty much sums up the atmosphere. We got a sampler of 13 beers ($10)! Most of the brews had some issues with Diacetyl. The only beers we thought worth a pint were the stout and the porter. Otherwise nothing stellar. We didn't have the food, but the service was good. I would come back to to have pizza which looked pretty good. In a town like Klamath Falls it is nice to at least have a place like this where you can have some brewpub beers. Looks like a fun locals joint. Big tables, a nice large bar, some nice smelling pizza, and tv's and games to keep you occupied. Quality was ok. I tasted their IPA, and it was pretty average. Didn't try anything else that is brewed there. But I was happy to be able to try the Ninkasi Douple IPA, and it was outstanding. Service was good. Very quick and friendly. Had a pretty big selection, I think it was about 9 or 10 local brews, plus some guest taps. Didn't try the food, just had a pint. Prices looked pretty reasonable. This place is kind of off the beaten path, but worth checking out. Located in a suburban area this is more like a Pizza place from the outside, in fact the beer is not brewed on the premises. Inside the bar area is nice with a mock gravity cask oak barrel and other beer paraphenalia. Different setting areas for dining and I did not notice a patio. Some really friendly locals and regulars. All tap nozzles were stainless steel and I did not see the kitchen. Wood tables, chairs, and bar gives the place some pub character. Restroom was clean. They have numbered (I think) glasses hanging from the ceiling for regulars that, because of gravity, hang right side up. Service was friendly, knowledgable, and prompt. A rather large selection of their own beers and one guest beer, no cask. Their Irish Stout and the guest beer from Klamath Basin Brewery (Pale Ale) were notables. The most essential fact about Mia & Pia's is that they brew excellent beers. Their expansive array of lagers, ales, and specialty beers covers a wide range of styles and approaches, leaving the visitor ample room to chose among strong ales, session beers, and beer designs that favor either boldness or subtlety. Such diversity makes hanging a quick reference tag difficult. But their beers can be characterized generally as being of modest potency, abundant flavor, and inviting drinkability. Head brewer Rod Kucera worked for years as a rancher and was once a pro bull rider on the western rodeo circuit. In 1996 he converted his family's dairy farm into a brewery using the tanks and refrigeration equipment that once processed raw milk. The conversion was a success. With Rod's beer and his parent's pizza, Mia & Pia's does a thriving business. Water is heated by solar panels to service an annual production of 300-400 bbl. Most of this is served at the family restaurant though a few select kegs occasionally stray north to Portland. The name "Mia & Pia's" pretty much says it all. This is a mom'n'pop pizza place; homespun and informal with a rustic western décor. It is essentially one large open room with sectional partitions defining the bar, two seating areas, and a banquet room. There's also a seasonal beer garden. It's helpful to know before you visit that neither the bar nor the restaurant provide table service and things like tableware or condiments are self-serve at the counter. Mia & Pia's beer menu features nine regular ales, four regular lagers, a host of varying seasonals, and inventive limited offerings. Their full roster of lagered beers is unique in its scope and quality. Outside of Seattle's Baron Brewing, I can't think of a single Northwest brewer that offers as many lagers. Their overall quality is outstanding, and it doesn't hurt that these smooth, bottom fermented beers are ideal compliments to western-style pizzas. Speaking of pizza, I must recommend the BBQ chicken pizza. It's thin crusted with a thick, sweet'n'smoky BBQ sauce whose appealing quirkiness caught me off guard. Mia & Pia's has no T-shirts, growlers, or souvenir bric-a-brac (a refreshing contrast to the otherwise constant onslaught of beer-obelia), but the staff is quick to run a stranger a tab and make you feel at home. Beer fans have much to celebrate at Mia & Pia's Pizzeria and Brewhouse. Several beers are brewed with barley and hops grown on the family farm, with spent grains fed to contented cows. Don't let those cows be the only ones so contented.